Fourth Row Center: Film Writings by Jason Bailey: On DVD: "Facing Ali"
Early in Pete McCormack’s documentary Facing Ali, one of his former rivals notes that Muhammad Ali is “more revered than any fighter… maybe more than any person.” That would certainly explain the surplus of documentary films about him; aside from the original, Champions Forever, and the standard-bearer, the Oscar-winning When We Were Kings, there’s Muhammad Ali: Made in Miami , Thrilla in Manila , Muhammad Ali: The Greatest , Muhammad Ali: Through the Eyes of the World , The Last Round- Chuvalo vs. Ali , Albert Maysles’s recent “ESPN 30 for 30” entry Muhammad and Larry, and more, many more. Why does he continue to be such a venerable subject for nonfiction film? Well, first of all, because of his uniquely American story and life—the talented kid who ascended to fame and fortune thanks to his mixture of talent and showbiz bravado, mounted multiple stunning comebacks, but couldn’t walk away while he was ahead—and its intersections with the defining events of his generation, the Vietnam War and the struggle for civil rights. He’s a fascinating figure, and he was so charismatic and dynamic on camera that he left a treasure trove of archival footage. And then, on top of that, he was the greatest fighter of his or any other time, a brilliant strategist and graceful athlete/aesthete who made brawling into an art. By choosing to tackle both elements of Ali’s greatness, and by adopting a fresh approach by telling Ali’s story through the eyes of the men who took him on in the ring, McCormack and his crew certainly set their ambitions high. 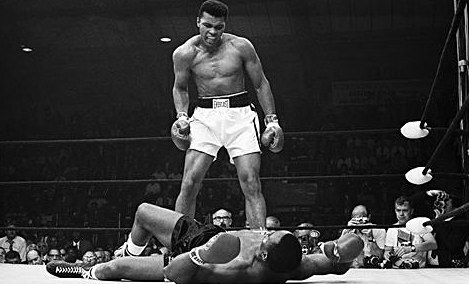 Indeed, they may try to do too much; though it starts off as more of an impressionistic portrait than a straight biography (exploring the theme of Ali as a person, as an icon, as a mythology), by the time they try to cover the man, his rivals, and the times, it too often ends up playing like an extended highlights reel. It helps that many of the men (particularly Chuvalo and Foreman) are exceptionally good storytellers—Foreman’s recollection of the moment when he decided to retire, for example, is absolutely riveting. And they’re smart guys; the logistical and psychological analysis of his fellow fighters (especially Lyle and Norton) is keen and insightful. The film is impeccably made, fast-paced and inventively constructed, with catchy graphics and clever on-screen text. But the amount of material that has been covered in earlier films keeps overshadowing what we see on screen. Foreman’s first-person play-by-play of the “Rumble in the Jungle” is mesmerizing, but can’t compare to the detail of When We Were Kings. The brief examination of the hurtful trash talk between Ali and Frazier can’t approach the intellectual depth of Thrilla in Manila. The tragedy of the Holmes match, and how those who cared about Ali watched him literally damaging himself in those final years, is painful here, but doesn’t touch Muhammad and Larry. And so forth. As a result, the stories of the lesser-known fighters (like Lyle and Shavers) end up the most compelling. But that’s not to say that Facing Ali isn’t imminently watchable; the curiosity factor about these men is sky-high, and the picture boasts a wealth of entertaining archival footage. This brisk tour of his major bouts and biographical high points covers a lot of material, and though there’s not much depth, there’s an abundance of style and verve. Ken Norton says, “To be in the ring with this man called Ali was, to me, an honor.” Leon Spinks says it more plainly: “There’s only one Ali. There’s only one.” In the closing passages of Facing Ali, those tributes and memories are genuinely moving, and though the film that precedes them may come up a tad short, it still offers plenty of compelling footage and noteworthy remembrances from its cast of champs. "Facing Ali" is available now on DVD. For full A/V and bonus details, read this review on DVD Talk.